I am undertaking a joint PhD degree with Simon Fraser University and National Dong Hwa University, in Taiwan. 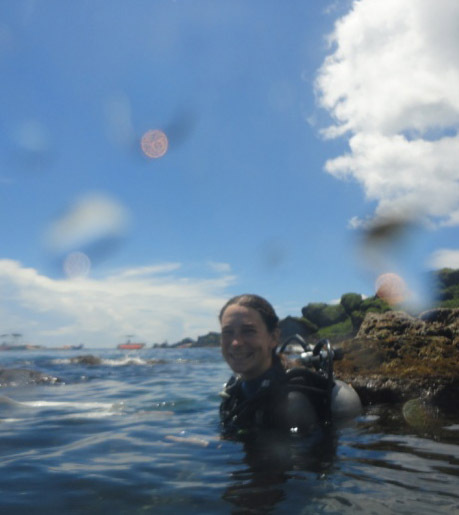 My research focuses on examining the influence of climate change on corals. Coral reef ecosystems are appreciated globally for their diversity and beauty, and provide fascinating study systems for marine ecologists. Yet, these ecologically vital and economically valuable habitats continue to be degraded by human activities, of which the most concerning influence is arguably climate change. Corals make up the foundation of a reef ecosystem, and therefore it is essential to gain a clear understanding of how climate change, specifically increases in temperature and ocean acidification, may affect these critical organisms. While important research has already begun to explore the implications of climate change for corals, these studies tend to focus on a limited number of species, typically only examine the individual influence of temperature or acidification, and generally lack the in-situ testing needed to attain a realistic understanding of the actual implications of climate change on coral reefs. For my PhD I aim to fill critical knowledge gaps by examining the combined influence of rising seawater temperature and increased ocean acidification on wide variety of coral species in both a laboratory and in situ setting. I am also keen to explore how restoration ecology and coral cultivation can be used to restore degraded reef ecosystems.